Interview between Charlie Avis, Public Information Officer for the Secretariat of the Basel, Rotterdam, and Stockholm Conventions, and Ridwan Tamin, Director of the Basel and Stockholm Conventions’ Regional Centre for SE Asia, located in Jakarta, Indonesia (BCRC-SCRC Indonesia). Charlie Avis (CA): Good morning and thank you for sharing the work of the Regional Centre for South-East Asia. Our readers would like to know what your work is all about and what are the major issues in your region! Ridwan Tamin (RT): Thank you, Charlie, at present our Centre is mandated to carry out capacity building and technology transfer activities for countries within the southeast Asia region in fulfilling the objectives of the Basel and Stockholm Conventions. 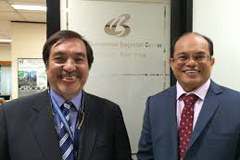 At present BCRC-SEA serves 10 (ten) countries within the southeast Asia region namely Brunei Darussalam, Cambodia, Lao PDR, Malaysia, Myanmar, Philippines, Singapore, Thailand and Vietnam. All countries have ratified the Basel Convention. Our core functions are on training, technology transfer, information, consulting and awareness raising. Issues faced within our area vary among countries ranging from issues on illegal transboundary trade of hazardous chemicals and waste, electronic waste, obligations to review and update national implementation of POPs, etc. Individual countries such as Indonesia may face particular issues such as the concern on mercury emission since Indonesia is considered as one of the largest coal users in the world. RT: The Regional Centre is housed within the Ministry of Environment and Forestry, formerly the Ministry of Environment. The office is located in Jakarta, we currently have 5 staff members including the Director, supported by 2 part-time scholars/technical staff dealing with the various themes that we are doing. The Centre was established by Decision III/19 during COP III in 1995, by which Indonesia was selected to host a Basel Convention Regional Centre. By 1997 the Centre under the guidance of the Ministry of Environment became operational under the supervision of the Director of Hazardous Waste, Ministry of Environment. In formalizing the Centre, Indonesia signed the Framework Agreement on the establishment of BCRC-SEA with the Secretariat of the Basel Convention in 29 October 2004 which was later endorsed by Presidential Regulation No. 60 Year 2005 on 12 October 2005. Hence the Centre was allocated a routine budget and office space within the Ministry and appointment of the Director of BCRC-SEA was by the Minister of Environment. CA: Do you serve all of the countries of the region, how many Parties are there, and how do you manage with languages? RT: We serve the 10 parties within the southeast Asian region which coincidentally are members of ASEAN (the Association of Southeast Asian Nations). The common language for communicating between countries is English. RT: Lately the focus towards e-waste has been increasing. Another issue that the countries have in common are the movement of Illegal waste, mercury issues. The Centre hosts meetings and workshops prior to COP Conventions, training on POPs. Also the center was involved in the review and update of POPs national implementation plan and aftermath activities such as follow up on PCB, identifying laboratory capabilities to analyze POPs, etc. CA: Tell me, please, in a nutshell what does “Synergies” mean to you (in relation to sound management of chemicals and waste)? RT: In a nutshell it means identifying the correct and precise counterpart having the same visionary stance in carrying out thematic activities of concern to its success. No BRS activity are stand-alone activities requiring the involvement of various related agencies/institutions. Unless there is same perception and strong common interest shared among parties or individuals to carry out a special job or particular activity then the chances of it failing becomes great and disappointment. CA: The Minamata Convention recently entered into force and COP1 took place in September in Geneva. How does that impact on your work? RT: Actually before COP1 Minamata entered into force, the Center had been offered an assignment to conduct the study of mercury from power plants in Indonesia. Similar works have been carried out in South Africa, Russia, India and China. This activity was for one year and nearing its final phase. CA: Finally, what are the major challenges ahead in this region, and how would you like the RC to evolve, say in the next 5 to 10 years, in order to meet them? RT: Major challenges are e-waste which is at the tip of the iceberg, illegal trade of hazardous waste which will requiring more enforcement capabilities. Countries within the southeast Asian countries will have to start identifying more POPs chemicals outside the 24 by the SC as guidance for the Ministry of Trade, meaning that would also have to update their NIPs, a lot of work…technical as well as coordination among stakeholders. RT: Thank you, Charlie, and if you need any further information on our centre and its activities, please go to our website www.bcrc-sea.org and we look forward to further working with you!